More than four million Canadians do not have a family doctor. Currently, Canada produces 2,300 new doctors a year but we need about 3,200 a year. How can we find 900 more doctors annually? Canada has failed to use the services of the thousands of international medical graduates (IMGs) in Canada who are unable to practise because they can’t get a licence. There are also an estimated 1,500 Canadian citizens studying at medical schools abroad. 1. A medical manpower czar should be appointed by the federal government. He should have a sufficient budget and manpower to undertake the task of making Canada self-sufficient in medical manpower. 2. The czar should create a registry of all IMGs who are in Canada but have no licence to practise. This can be done via the media. 3. The czar should conduct a survey of these graduates to find out what each one of them requires to be fully licensed. 4. From the responses, the czar should create conditions and provide financial help (in conjunction with teaching institutions, hospitals, licensing bodies and provincial governments) to assist these overseas-trained physicians to be fully licensed in one year. 5. Those who fail to get a licence should get one more try. If they fail again, they should be told to pursue other careers. 6. Those who accept government help should promise to work in an underserviced area for two years before they move elsewhere. 7. The czar should create a registry of Canadian medical students overseas. Again, the media can help get the word out. 8. The czar should survey these students to find out how many of them want to return to Canada to do their residency and practise here. 10. The czar should offer them financial incentives to come back to Canada via signing bonuses. This can be done in conjunction with hospitals and provincial governments. IMGs and Canadians studying abroad did not cost the Canadian taxpayer a single penny to train. So what is wrong with investing some money in them to absorb them into our system? That is surely better than spending thousands of dollars on Canadians who obtain their MD in Canada and then move to the U.S.
Dr. Noorali Bharwani comes to the awkward conclusion that as a surgeon he has certain skills but as for the general doctoring skills others seemed to have-uh, not so much. 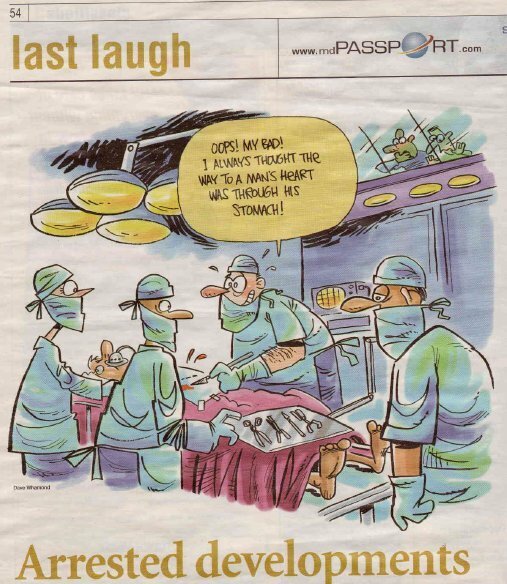 Cartoon from article in Medical Post. When it comes to cardiac arrest, we, the surgeons, do not get any respect. When it comes to severe trauma, a general surgeon is expected to be “captain of the ship” and take command of resuscitation and stabilization of the patient. This is because we know the first three letters of the alphabet: ABC (airway, breathing and circulation). When I was a general surgical resident, I was not part of the cardiac arrest team. I confess, beyond ABC, I have difficulty remembering what to inject and where to inject drugs during cardiac arrest. Should they be given subcutaneously, intravenously or intra-cardiac? What does the ECG say? I can read a flat line (by that time it is too late anyway) but I would have trouble interpreting anything else. I am not totally useless. I can intubate a patient, perform a tracheotomy, do a cut down on a vein and place an arterial line. Beyond that my medical knowledge is not that strong. I was beginning to develop a complex. I was jealous of the internal medicine residents who acted so smart. Their white coat pockets bulged with concise pocket guidebooks, hammer, tuning fork, flashlight, different coloured pens and a stethoscope hanging down their necks. They would know the precise dosage of medications and would know exactly what to give at what stage of the cardiac arrest. In order to regain my confidence and self-esteem, I decided to do three months’ elective in ICU as part of my surgical residency program. Word of my limited knowledge of cardio-respiratory medicine must have reached the medical staff of ICU because the only procedures I was assigned to do were tracheotomies, intubations, cut-downs for venous excess and insertion of an arterial line. This further exasperated my frustration and low personal esteem. It did not get any better when I went into practice. One day, I had done a right hemicolectomy on an elderly patient. Within the first couple of days after surgery, he developed severe chest pain and went into cardiac arrest. This was about two in the morning. The nurse phoned me to say the cardiac arrest team was there to resuscitate the patient and she was letting me know what was going on. She said the ER physician was dealing with the cardiac arrest. I felt guilty that I wasn’t there to be “captain of the ship” and save my patient’s life. By the time I dressed and rushed to the hospital the patient had died. I could see the straight line on the ECG, the pupils were fixed and dilated, he was not responding to painful stimuli, he had no heart or breath sounds. Like a true captain I called off the resuscitation process. I was reluctant to identify myself knowing my limited capacity when dealing with medical problems. At the request of my family, and not wanting my children to see me being a wuss, I pressed the overhead button. The air hostess came. “I am a surgeon. Is there anything I can do to help?” I asked. Although I was relieved to hear everything was going well without my services, I wondered what would have happened if my services were needed. Would I have failed to save somebody’s life? That question weighed heavily on my chest (no pun intended). I started to get nightmares. In my sleep, I would recite the protocol of managing cardiac arrest. One night, my wife shook me and woke me up. Apparently, I was trying to give her mouth-to-mouth resuscitation while massaging her chest. She said I had been doing that every night since we got back from our holidays. Except, this time I was getting a little too excited! “Honey, you don’t have to be that rough. If you want something then just ask nicely,” she said. Why didn’t she say that before? Yes, physician health matters because physicians are a valuable human resource. From Nov. 30 to Dec. 2, 2006, I was in Ottawa attending the 2006 International Conference on Physician Health. It was organized by the Canadian Medical Association (CMA) and the American Medical Association (AMA) and was attended by delegates from Canada, the United States, Europe, Australia, New Zealand and many other countries. This years conference was 18th in the series since its inception in 1975. This years theme was Physician health matters: preserving a valuable human resource. The delegates at the conference heard about the latest research on physician health, about new skills to survive and thrive in their careers, and learned about the progress is being made around the world to protect the health of physicians. The organizers of the conference say that by raising physician health issues at an international policy level, the conference seeks to promote a healthier culture of medicine and decrease the stigma associated with physician ill health, thereby decreasing barriers to physicians seeking timely personal care. In 2003, a survey conducted by the CMA found 46% of Canadian physicians were in an advanced stage of burnout. Physicians feel they have to work harder and longer hours because there is a shortage of medical manpower. With information overload there is a significant pressure on physicians to satisfy the demanding public, and there is constant political battle within our health-care system to obtain a fair share of resources to provide good patient care. All these factors do affect physicians personal and mental health and their capacity to deliver good patient care. In order to help physicians understand the importance of looking after their own health, the CMA set up a Centre for Physician Health and Well-being. Since then, every province in Canada has established programs to help physicians and their families cope with the stresses of work and encourage healthy behaviours within the physician population as a whole. At the conference, I was pleased to learn that every physician in Canada has access to a physician health program. In Alberta, it is called Alberta Physician and Family Support Program. The program has a toll-free number and a physician or a family member can call this number for help 24 hours a day. As we know, prevention is better than a cure. In the last few years, medical students, interns and residents have been in the driving seat promoting ideas on physician health and well-being. They are educating themselves at an early stage of their professional lives to look after themselves and their families. They have learned to reduce the hours they work, they have learned to say no when they are tired and they have learned to balance their lives. I belong to a foolish generation of older doctors who took pride in working round the clock. Readers of my newspaper columns in Medicine Hat, Alta., and those who have read my book, A Doctors Journeyan emotional and humourous look at life through the eyes of a doctorare well aware of my trials and tribulations with my own health. I learnt my lesson too late. In the last four years, I have tried to change my practice and find a better balance in life. It is hard to break old habits. After all, work is a kind of addiction. It takes about one to two years to “detoxify” oneself. During this process, one needs an understanding health-care administration, understanding colleagues, good friends and a devoted family. Count yourself lucky if you get all four groups rooting for you during your down time. As one door closes, another one opens. So be brave, doctor, remember to heal thyself first.